An Englishman’s home is his castle, but for the first European settlers who came to New Zealand, their first priority was to create a productive and, later, ornamental garden. 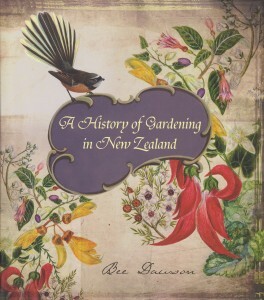 Bee Dawson traces the development of gardening in New Zealand, from the Maori gardens of pre – and early contact times through the optimistic efforts of missionaries and the other early settlers, the magnificence and productivity of the Victorians and Edwardians and the Dig for Victory campaigns of the 1940s. Illustrated throughout with historic photographs, paintings and ephemera, Dawson’s lively writing style brings to life the successes and failures and the sense of achievement felt by New Zealand gardeners through the years, as they coaxed plenty and beauty from a new earth. This book is both beautiful to look at and a delight to read.